A few dishes I make call for a ‘real’ old fashioned pie crust… Something light & flakey, delicious for both sweet & savory dishes. I’ve tried several Gluten Free Pie Crust Recipes, and even store bought ones – But, honestly, they were just awful & expensive! After multiple attempts on my own, I finally got this recipe just right – and best of all, it’s both Gluten AND Dairy free! Since originally posting this recipe, tens of thousands of people have tried it & love it too! It’s been featured in magazines, online & enjoyed around the world. I hope you’ll make it a part of your family’s traditions too. 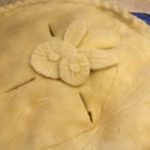 Use this Gluten Free Pie Crust Recipe with my Chicken Pot Pie Recipe, Dairy Free, Soy Free Pumpkin Pie Recipe, or my Apple Pie Recipe. This crust rolls out smooth, can be cut into fancy decorations, bakes up perfectly light, and tastes amazing! Feel free to make the crust in advance and keep it in the fridge or freezer until you’re ready to use it. Plus, you can easily adapt this for desserts or main dishes. Thank you sooo much for this recipe! It felt like I tried a million different things that never worked, and this one was amazing! Thank you for this delicious pie crust recipe! Chicken Pot Pie is one of my husband’s favorites and I made one yesterday using your recipe. It was a hit. He and my son are still taking about it and the whole pie was gone in one day! The crust was so easy to make I made a second one to put in the freezer for later. Thank you again for blessing all of us and sharing your ideas! Do you think coconut oil would work in place of the palm shortening? That’s the one ingredient I don’t have on hand! The coconut oil worked beautifully!! I chilled it a little first and it turned out really flaky. Thanks so much for this recipe! We really appreciate you posting all of these gluten free recipes! So yummy…finally not too sticky or crumbly! :) Thank you!!! My daughter is wheat and dairy intolerant, and I am trying to make a favorite cranberry walnut tart for her and her family for T-Day. Do you think Crisco would work in place of the shortening you suggested as I can’t find that in my area. Would margarine work as another alternative? Love your website!! Annette, I used this recipe with coconut oil in place of the shortening and it turned out perfectly! Leslie: Thank you for your comment. How much coconut oil did you use? Was it a half cup as in the original recipe? Yes, the same amount, and I put in in the fridge for about 10-15 minutes first. Hi, Erika!! Thanks a lot for making this recipe available!! 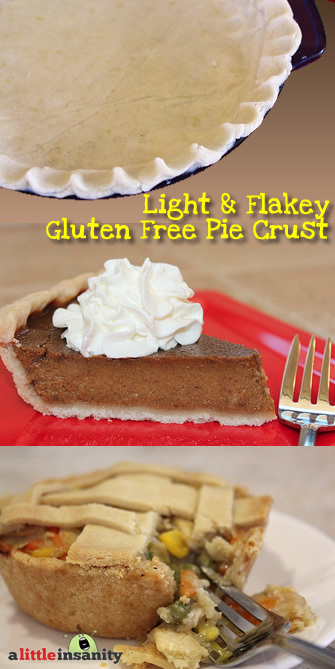 I can’t wait to try it..:) I am planning make gluten-free pumpkin pie for Thanksgiving. I have a question: can I make the crust ahead of time? Should I pre-bake it before freezing it? Or should I just freeze it (or refrigerate it) raw? I have frozen the raw crust before without any issues… and it keeps for a week or so in the freezer if it’s wrapped well. But, you can always par-bake or fully bake it it with pie weights (to avoid shrinkage), if you need it for another type of recipe that you won’t be baking (like a chocolate cream pie or a lemon meringue). And… how long can I freeze/refrigerate it before using it? Hi Erika, I made this crust last night and it ended up turning out really hard! Do you know what I could have done to prevent this? I used coconut oil in place of shortening and used my egg replacer. I may have left it in the oven a tad longer than I should have I am thinking – would this contribute to that? I don’t know why the crust came out hard… but it may have been from overcooking or ‘frying’ from the coconut oil. Did you pre-cook the shell by itself, or did you have ingredients in it at the time (like pie filling)? The crust can crack easily while raw if there’s not enough moisture, but even so, it can be pressed back into shape very easily. Perhaps it was the egg substitute? I know this comment is late, and you have probably solved the problem by now. 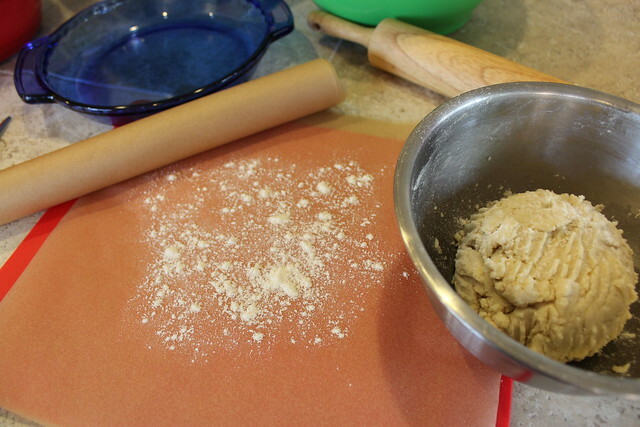 For what it’s worth…My grandma taught me how to make pie crust, and she always said that tough crust comes from overworking or overhandling the dough. Since coconut oil gets soft so easily, I think chilling it really well before you use it, and then mixing just until blended will help with texture. 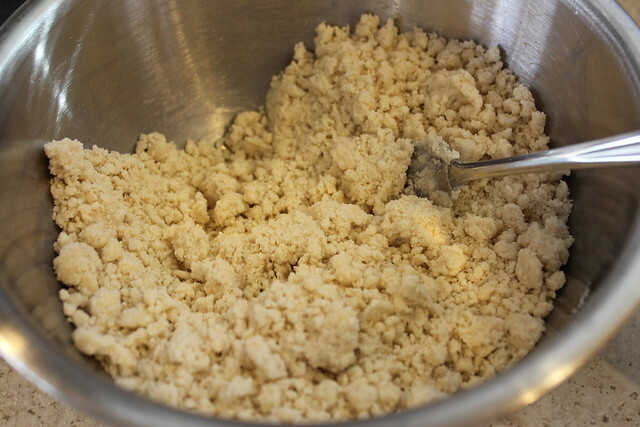 You should be able to see chunks of coconut oil (or shortening or butter) in your blended crust when you roll it out. Another thing actually as well it seemed to break really easily while trying to put it in my pie pan, I had to patch it quite a bit. First time gluten-free crust maker here! Thanks for posting the recipe. This is my first successful GF pie crust! All others have been total fails:(( Thanks so much!! Yay! I’m so glad it worked for you… Thanks for letting me know! This recipe is delicious! I made rhubarb pie using your pie crust recipe last night and everyone raved! I actually tried it out on non-celiac family members and they had no idea it was gluten-free (I still haven’t told them :) ) and they just LOVED it! Those who actually do have celiac in my family can finally have pie again! So glad I discovered your site! Oh, and I’ve also been using your flour mix to make muffins….banana, apple, pumpkin….and they’ve all turned out amazing! You have made gluten-free baking stress-free! Thank you so much! Hi Erika, do you recommend prebaking the crust a bit before adding the filling for a chicken pot pie? I’m afraid that if I bake it raw all at once, the bottom won’t be nice and crispy. Thanks! might be a silly question. I want to bake an apple pie with this crust. Can I make the crust, throw the filling in with another crust on top and bake it like a normal Apple pie? Thank you a million times for your gluten free pie crust recipe! We just made our first gluten and dairy free pumpkin pies (trial run before Thanksgiving) and no one could tell the difference from the original! The crust is flaky, but still holds together – and it’s delicious! Can’t wait to serve this to the family at Thanksgiving and see their faces when we finally tell them it’s gluten free – some are convinced that everything gluten free is gross and disgusting. Since my daughter has very severe celiac disease, it’s crucial that everything be gluten free. I’m so grateful, and looking forward to trying more of your recipes! I am a new viewer of your website. My son is gluten free and dairy free. I’m wanting to make him a homemade pie that he can eat. I am going to try your pie crust recipe. I have a question… Is there anything besides butter that I can substitute for the Palm shortening? Thanks for your time. May God bless you! Yes, many people have had great success using Coconut Oil in place of the palm shortening, but you can also use Crisco or other shortening. Hope that helps! Do you have to use an egg in the pie crust? I’ve always done short crusts with just the butter or other fat and flour and salt. Feels a little weird putting an egg in the crust. Am I missing something or is the baking time missing? Nice catch! =) But, I didn’t list a specific bake time or temp since most pie recipes have their own set of instructions which I recommend following. thanks so much for the pie crust recipe! Enjoyed reading your personal comments and seeing pictures of your beautiful family! FINALLY. 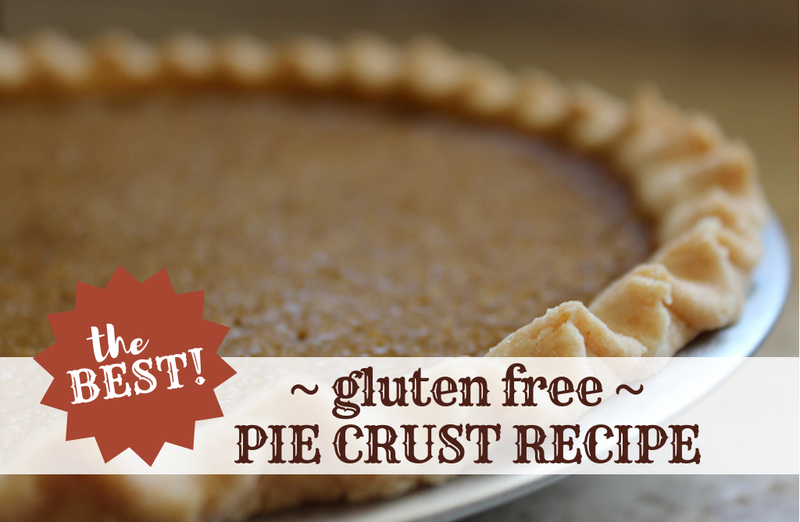 Gluten free, dairy free pie crust that TASTES AMAZING!! I used Nucoa instead of palm oil because that’s what I have and that’s what I’m familiar with, but I have confidence that any shortening substitute would work well here, also. Can I use a link in a Facebook post to this recipe? My autism group would love this; many of our kids are gluten and/or dairy free. Awesome recipe, thank you! I have to try this gf pumpkin pie recipe. I just saw a post where a company was saying one of their pies was $23. Are you freaken kidding me?? Having Celiac doesn’t automatically make us independantly wealthy where being ripped off is no big deal. It’s quite the opposite. Every penny counts…. HI, Im making my GF friend a pecan pie for her birthday, but I only have so much FL flour, if i only need one side, could I halve the recipe and use the rest of the flour for rolling it out? I don’t think i could use regular flour to roll it out? The gluten would still be there, even though its not actually in the crust. Im just wondering about the consistency, if it be the same? Absolutely not can any amount of regular wheat flour come into contact with anything that is gluten free. Doing so instantly causes cross contamination. Whether your friend is gluten intolerant or a full out celiac, we cannot come into contact with anything containing gluten. You also need to read the ingredients list of any products used to make that pie. If anything says it may contain wheat or has wheat processed on the same lines as the gluten free product it’s considered cross contaminated. Preferably a brand new pie pan as any old crust hidden in the grooves of that pan will cause her to have an immune rreaction. All it takes is 1/64th of a crumb to set off an autoimmune reaction. I’m not familiar with those brands of gluten free flour. I live in Canada, so that could be why. Is there a Bob’s Red Mill kind that you can recommend? Very sad experience! My first attempt at gluten-free baking, I have a friend staying with us that is gluten intolerant. I wanted to make my “famous” deep dish apple pie so that she could eat it. I didn’t have parchment paper, so I used waxed paper instead; my coconut oil was melted because of the very warm kitchen. I’m not sure which of the issues were the problem or if they all contributed. I tried three times to get the rolled crust into the pie plate, each time it crumbled to bits on the way, not enough water? I added more cold water, rolled it out again and tried again with slightly better results each time. The final time I just pieced it together best I could in the plate and moved on. I just laid the top crust across the pie in pieces since there was no way to piece it back together. It looked terrible but I hoped it would taste okay anyway. When I tried to serve it the crust was dry and crumbly, the filling was dry, nobody complained but my husband asked me not to do gluten-free again. I’d really like to try again, should I throw away the leftover dough and start all over? 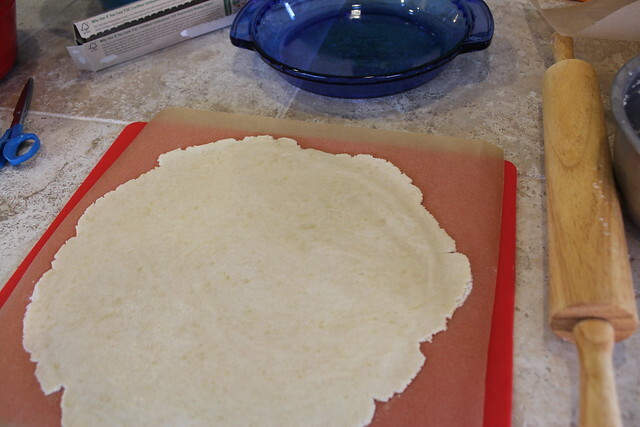 Can I try the same dough but with the parchment paper? I stored it in the refrigerator, should I let it warm up before working with it? Please help, the holidays are coming!! Guess the butter needs to be cold. Mine was room temp – bad. So soft of a crust, just spread it in and dollloped it on for the top crust. Will remember next time. 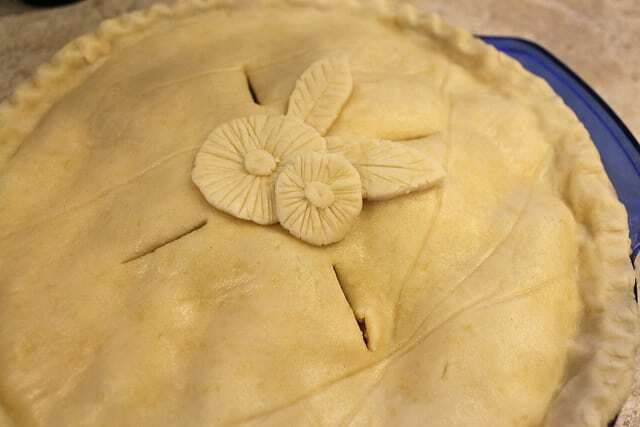 I love to bake but pie crust has been my nemesis for years – for some reason I can never quite get it right. I personally don’t eat gluten-free, but a few family members do so I decided to try your recipe for Thanksgiving. WOW. Besides being the most successful pie crust I’ve ever made (it didn’t shrink! It’s flaky and tender! I didn’t even burn it! ), it is absolutely delicious. I used Pamela’s flour blend because I had some on hand, and Earth Balance vegan butter. I can’t wait to share it with my family. I may be a gluten lover, but this may become my new go-to pie crust recipe! Hi! So I’m sad to say this didn’t turn out at all, and I’m not sure why! I followed the recipe using the option of butter. It was impossible to get into the 9″ pie pan in one piece- it was very cracked despite lots of water, so I had to squish it together in the pan. After making my pumpkin pie and baking it with the crust (which was previously unbaked) I pulled it out to find that the crust is 100% crumbs, with no structure at all. What did I do wrong? Thank you Erika! I did use the eggs. My husband reminded me that since we live in Colorado at a somewhat high elevation (~5000ft above sea level) my recipe failure may have to due with our elevation. It’s so strange, many times recipes here come out 100% normal, while others have to be adjusted. We are from VT and not used to the change in baking! Clearly this one needs some extra special something to help with the altitude. No idea what, I’m going to have to ask around. I will say the flavor was delicious, we had it tonight and although it was a crumb crust instead of a pie crust, we all thought it still tastes really good! I will have to try the crust again with a gf turkey pot pie later in the week! Delicious. First attempt at GF pie-crust and it was lovely. Made my husband’s first GF Thanksgiving a little better. Thank you! I can hardly wait to taste this! This is one of DOZENS of recipes I’ve tried over the last 7 years (several were my own creation) so far this is the most beautiful to work with! I did a Dutch Apple filling and lattice top! It’s in the oven now, but I had to thank you in advance! God bless you!! 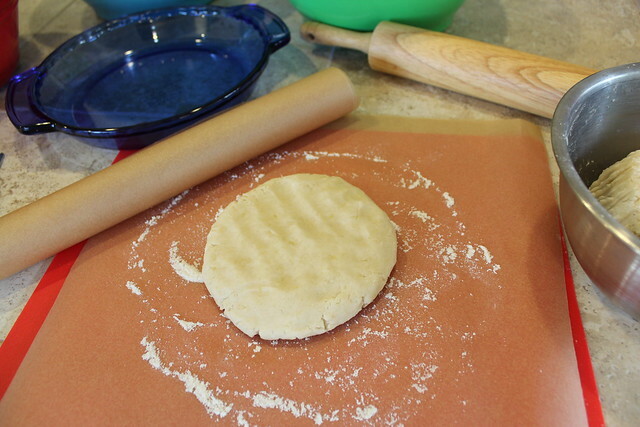 This is the best gluten free pie crust recipe I have found and I’ve tried a lot of them. Very flaky crust, nice texture, and almost identical in taste to gluten pie crust. Dough was easy to handle although I chilled it before rolling out and after I flipped it into the pie dish. Just a bit of chilling made it easier to handle. Crust around the rim was just a tad harder–I guess that is from the extra handling to make the rim. Will definitely be passing this one on and using it from now on. I made a streusel topping using GF flour. Next time I may add a bit of oatmeal to that as it sort of disintegrated into the apple pie. 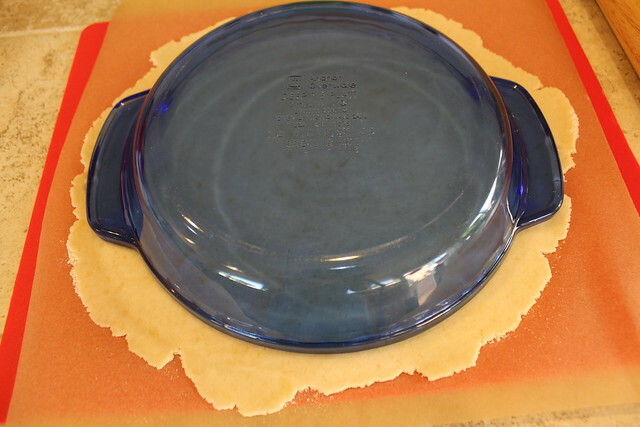 Turn the pie plate over and lift crust to it! I just have to say how scared I was too try making a pastry crust, gluten free again. In the past I failed miserably. They typically fall apart and stick. Everything went beautifully. I used namaste gluten free flour blend. Initially I thought the dough seemed dry but decided to form it together and refrigerate over night. Rolled it out today and it didn’t stick at all. I put it in a rectangle disposable pan and made pumpkin pie filling then baked it. Looks perfect!!! I’ll update on Christmas if it’s gummy but I don’t project it to be. I’ve made gf biscuits and dumplings and they are always gummy. Thank you so much for this recipe. I’ve been wanting to make a French Meat Pie for my family but couldn’t come up with a good GF pie crust. My husband will be thrilled with his supper tonight! Thank you SO MUCH for this wonderful recipe! Perfection on my first try! And I’ve tried so many recipes before, that I really was pretty doubtful. My family was raving : ) God bless you and your precious beautiful family. Merry Christmas! The crust did quite fine. Remember that you can add a little water to the areas that cracked wait a minute and push them back together. You do have wait a moment though for the water to soak in. I was told that the crust held but needed more of a butter flavor. Wasn’t sure if she meant the crust or the apples. Another person said a little more salt in the crust. And another the usual teased that they were sick after eating it as usual with a smile… funny thing is he hate the whole piece and didn’t know it was GF so he doesn’t count just being silly with a smile. As I’m sure you all get at some point or another. So there.. a lovely crust indeed… make a head of time and see how you like it. I thought it was quite fine and would have been even better if I had rolled it out a bit thinner. **** when making pie crust make sure all ingredients are very cold. Thank you for a fantastic recipe! It turned out beautiful and went over extremely well for Christmas! This crust recipe is amazing! Simple to make and delicious – it has come out perfectly both times I have tried it. Thank you! So I experimented with this crust recipe for Pie for Pi day (3.14) I did one with egg (as called for) & OMG, this was outstanding; then I did it without the egg, but all other ingredients as stated (a little crumbly, not as nice to work with); NEXT time I will try it with a vegan egg-replacement powder & see how that holds up. In all of this weekend’s experiments, I used Crisco, not butter – so it was GF/DF but not GF/vegan (of course, with the egg). Honestly, I must say that the egg really gave it that extra *something* So maybe next time when I will use a vegan-egg-replacer to see if that does the trick??? I will report back. I’d like to give it a go with chicken pot pie as well :) THANK YOU SO MUCH FOR THIS RECIPEEEEEE!!!! How do I post a picture of my pie here? Hi. Do you think that olive oil could be used in place of the shortening? Best gf pastry recipe I’ve ever tried. I made a fake-meat and vegetable gravy pie. Thank you very much! Indonesia and Malaysia are being deforested to create palm plantations as a source for palm oil. The Union of Concerned Scientists is recommending against its overuse. Please consider removing it from your recipe. Have made this several times and it always came out great. Many people couldn’t even tell it was gluten free. But today it just wasn’t coming together correctly. Not sure what I did wrong–suspect I may have combined the flour and butter too long. Will be interesting to see what happens the next time I make it. Is there a recipe for the flour mix? Or does that have to be ordered ? I have tried so many different types of gluten free crusts. Finding a regular one was hard enough but it seems as if the gluten free stuff usually has some issues. NOT THIS RECIPE! This crust was amazing. I made quiche with it and I am thrilled! Really good and flaky. I have a hard time with most GF pie crusts. Next time I will try palm oil shortening as the coconut oil I used has a predominant flavor. Still good though I made it for Paula Deen recipe for Tomato Pie. If I use the King Arthur flour, how much xanthan gum would your u recommend? I noticed no one answered the above post and I was also curious. I’m newbie at Celiac and need a pie crust recipe. I read that you could use King Arthur GF Flour (which I have), but do you have to add xanthum gum when making the pie crust recipe? Omg. I am gluten free but husband is not. He said it tastes like his grandmother’s pie crust!! Thank you so much for this. I used pillsbury gluten free flour, Crisco baking bars shortening, and a pastry mixing tool! I did not add xanthan gum to the pillsbury flour. It is amazing!! I want to second this question! Is it an 8 ounce cup dry weight? How about in grams? I was wondering how much xanthan gum I would add to this recipe. I have my own gluten free flour recipe that I love but it does not have the xanthan gum in it, so I would need to add it. Hi from NSW Australia, was wondering, is this a crust you would recommend for our quiches? Amazing how the positive comments are encouraging and continue on for 3 years! I used Bob’s Red Mill GF flour and it worked well. I have used King Arthur GF Flour for other recipes, I’ll try it for a pumpkin pie and report back. Thanks for the great info. This is a pre-Thanksgiving prep. I know, it’s two months away. I want to be sure and have time to try others if these don’t work so well. Besides, is there a limit on the number of pumpkin pies one can make? I just finished making this pie crust (using cold butter) and Namaste Gluten Free Flour and I had wonderful results (I haven’t baked it yet) as I’m making the pumpkin pie tomorrow. So it’s in the fridge waiting for that. But I have to say I’ve never had any luck years ago making regular pie crust as I did with this recipe!! (I went g.f. 3 years ago) and was afraid of failure making a gf pie crust but not anymore! I haven’t tasted the final product yet, but it was a “breeze” rolling out and it looks awesome in the pie plate! Thanks very much for this recipe and if it turns out (taste test to yet come) then it’ll be a ‘staple’ in my recipes!!! I am new to gluten free baking and while I am a very experienced baker, baking gluten free is proving to be quite a challenge. I tried your pastry recipe based on the good reviews it had received. I made an apple pie and a pumpkin pie this weekend. Both pies turned out ok, but certainly not my usual fluffy light pastry that \i make with wheat flour. 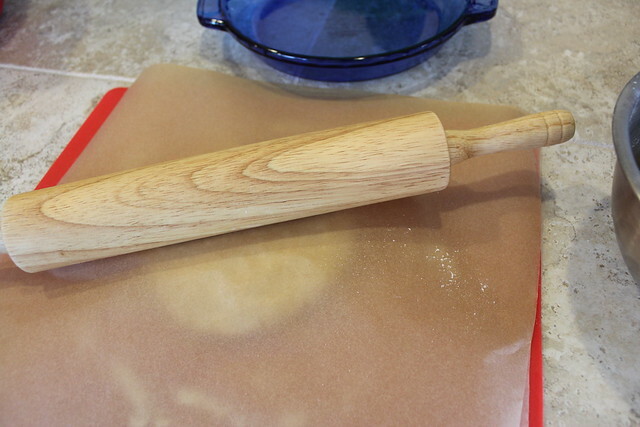 When I make wheat pastry I always chill the pastry before rolling it out. So I did that with this recipe too. When I made the apple pie, the base was in the fridge while I rolled out the top, then I assembled the pie and put it in the oven. The top pastry did not go in the fridge after being rolled out. When I made my pumpkin pie, I rolled out the pastry and put the shell in the fridge while I mixed the filing. Then added the filling to the cold crust and baked as usual. What a difference chilling the dough first made! The pumpkin pie was much nicer than the apple. I would highly recommend making sure you chill the dough really well after rolling it out before baking; for me it made this pastry much closer texture and fluffiness to my regular wheat pastry that I’ve been making for years. I see you can use Crisco shortening. Can i use the “Butter flavored” Crisco? Will it change the effects/taste any? Thank you so much for sharing this recipe! My husband and oldest daughter have celiac disease, and I have been trying to create gluten free versions of all of our favourite desserts. 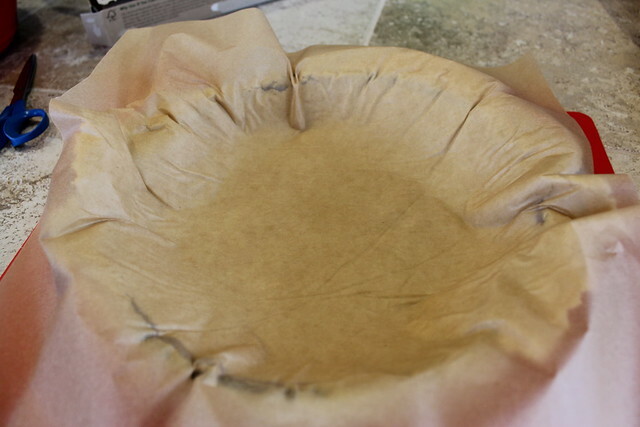 I’ve been mostly successful, except for the elusive flaky gluten free pie crust….until now! I used vegetable oil shortening and my pies turned out flaky and my family couldn’t tell that it was gluten free. Thanks again! Hi, I saw som posts above regarding adding xanthum gum. I have King Arthur GF flour and it does not have any xanthum gum in it. Do we need to add some and if so how much. This is my fist time making GF as my daughter is gluten sensitive. This detail would really help as I want to make a trial pie before thanksgiving. Erica i think you very much for this recipe. I have tried so many pie crust recipes and they were just awful and very complicated. Had to use Ice and ice water and they weren’t very tasty. Thanks for the great recipe. Can I use Bob’s Red Mill Gluten Free Baking Flour? I tried this recipe and used Bob’s Red Mill 1 to 1 and cold butter instead of shortening. Delicious! refridgerated pie overnight and it was rock hard this am (Thanksgiving). Will it soften up with baking and be as delicious as the one I made last week without refridgerating???? Thank you for this recipe. It’s the best gf pie crust recipe I have found. Very flaky and great flavor. Thanksgiving is much tastier for our family this year! I have a question. I do not have the tin foil pie pans in order to make two chicken pot pies-which are on my menu to make on Saturday. Instead, would it work to double this crust recipe and press it into the bottom of a glass 9 x 13 casserole dish, and then use the remaining two crusts for the topping? I would let the family eat half of it, and then put the other half in the freezer. What are your thoughts on this plan-before I try it? I had never made homrmade pie before ever!!! Let alone glutenfree. This crust is flakey and not at all musshy or heavy. My husband us not gluten free and he loves it. It was really easy to make. Thank you so much now i can eat pot pies again and cherry pie . OK, I made 2 pecan pies last Christmas using this recipe. The dough rolled out and handled beautifully and made a lovely looking pie crust. However, it was tough instead of tender. I used Bloomfield Farms Gluten Free flour mix and butter for the fat. Do you think the flour mix would make a difference? I can get King Arthur or Bob’s Red Mill at my grocery. It’s almost time to bake them again, so any input is appreciated. I really want this one to work! I think Erka’s GF flour blend is so simple to get together, and less expensive than store-bought GF flours. I’ve used it and had fabulous results for my pecan and apple pies on TG. I had the same experience with King Arthur All Purpose GF flour (not the newer Measure For Measure) and Spectrum shortening. Also, the palm oil shortening had a metallic taste I didn’t like. can i make the entire apple pie and wrap well and freeze? then bake, right from the freezer, do you think it will turn out OK? This crust is outstanding! Absolutely the best gluten free crust I’ve made. 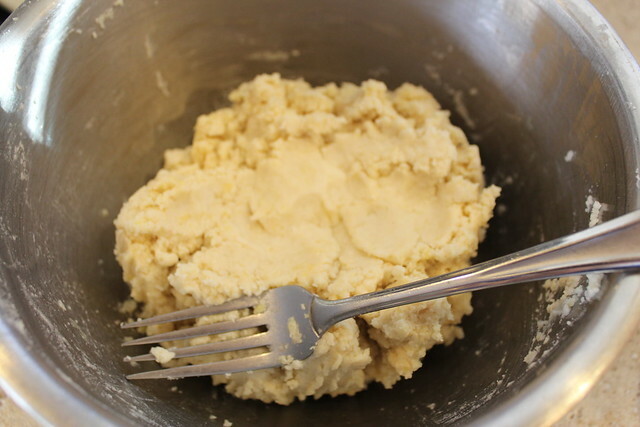 I substituted amaranth flour for the sweet rice flour portion, and it has a great taste. This crust is awesome!! Thank you!! I have struggled with gluten free crusts! I know a lot of people don’t like Robin Hood flour but that’s what I used (the one with xantham gum in it) and it worked great!! Thanks again!! I usually don’t like the texture or taste of gluten free baked goods, but this was a good crust (I used real butter). I used Bob’s Red Mill gluten free flour. The top crust tasted better because I think my bottom crust got too soggy, but I didn’t miss the gluten. One thing I noted was that it was overly sticky and so it held together poorly. Most likely I just needed to keep it cooler while I made the filling. Overall excellent recipe. This looks delicious! I have had trouble with gluten free pie crust in the past, so I excited to try this! Your pie recipe sounds wonderful (and all the glowing comments on taste is encouraging) – I will be trying it myself some time this week (in honor of Twin Peaks’ TV show rebirth, I will be baking a cherry pie! ) I am curious, since I am not sure yet which GF flour (all purpose) I will be using – I notice you have no xanthan gum in your crust recipe – would adding a half teaspoon (for two cups flour) just to be safe be appropriate? BTW, your own GF all purpose recipe sounds perfect – will have to whip up a batch one of these days. 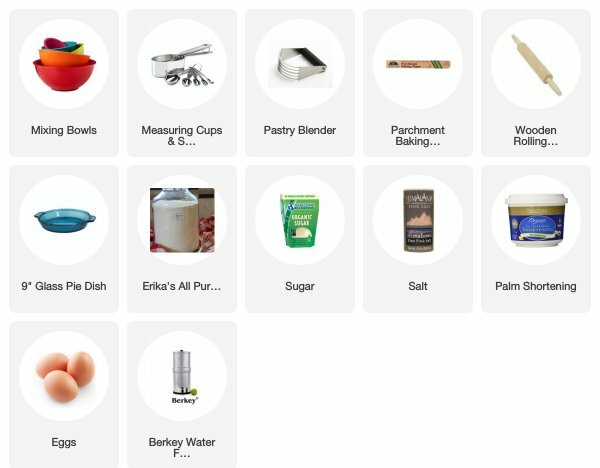 I actually use King Arthur brand, but I recently bought another brand to try out as well (and I am almost out of King Arthur) – next up will be me making your GF flour blend! Can domata flour be used? Cause that is what I use. Also, what size quart mixing bowl are you using to mix your flours together when making your GF all purpose flour – 8 qt.? 13 qt.? 16 qt.? Larger? You should put that link up to Amazon as you did with your glass jar to hold the flour – would be helpful. Thanks. 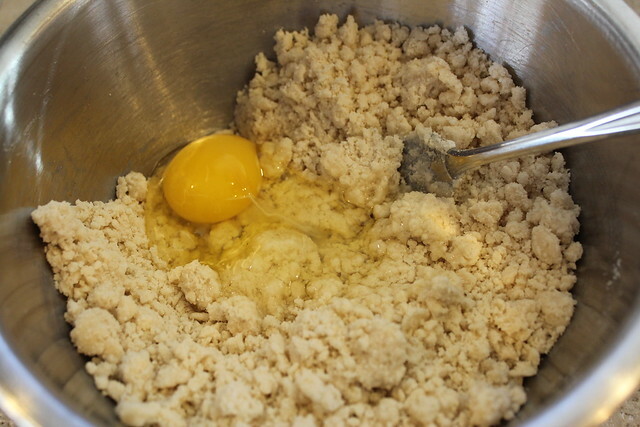 When making the pie crust, can you use a mixer to blend the ingredients together? I noticed you used a pastry blender. I wondered if it would make a difference. Also, thank you so much for the flour blend recipe. I use it all the time!!! How great your dish is! Can i combine butter with coconut oil when using these ingredients as replacements for palm shortening which you suggest? I haven’t tried it yet but i was wondering if i can use robin hood gluten free all purpose flour? I would like to make it next week for my fathers birthday and hes gluten free. Could you please respond asap. Thank you. This is for 9″ or 10″ pie crust? I know this was asked before but I did not see the answer. Can I use Crisco shortening? I’m sure you could use crisco, just make sure it’s ice cold. Hi! I bought Robin Hood GF flour, it does not contain xantham gum, would this recipe need it you think? Definitely 5 stars!!! Delicious! I think I liked it better than a gluten crust…Used it for a quiche, worked perfectly. tomorrow I’ll make an apple pie crisp and I’m so excited!! No tummy hurt, no bloat, no heartburn!! Thank you thank you!!!! Made this crust several times now for chicken pot pie. Has come out pretty good each time! I use butter flavored Crisco, Walmart brand GF Flour and no sugar, just in case that helps anyone else. Was gonna prep for Thanksgiving pies today, but I’m wondering if you have a measurement you use other than cups for flour? Grams? I’m finding the importance of weight with gluten free baking! Googled around but I’m finding conflicting numbers, so I figured it was best to ask you! Had a total lightbulb moment and just looked at the nutritional label and added it up. Oh golly. Gonna go make more coffee once I’m done laughing at myself. My family loved the crust! I made a different pie with regular store bought crust and this (gf) crust was really delicious! 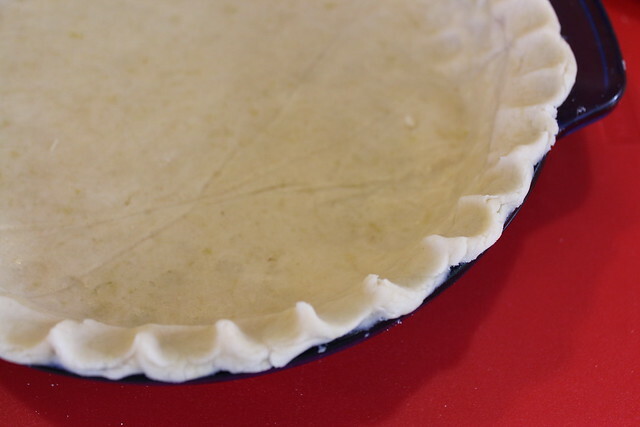 For a savoury crust like with pot pie use brown sugar in place of the white granulated. If you don’t normally add sugar, just add half the amount listed, using brown or even raw sugar. If you like, add about 1 tsp or so of well-chopped Rosemary. Especially if using coconut oil, chill before measuring and chill the pie while waiting for the oven to heat. This will help your crust be flakier. This recipe saved the day. After two tries using my usual pie crust recipe with gluten free flour and failing miserably, I tried yours. It was absolutely dreamy–it rolled out softly and elegantly and made a lovely fluted edge. I’m taking it to a party tomorrow night with a gluten free friend and hope the taste will be as great as the crust preparation was. I made a pie crust shell and plan on filling it with an ambrosial sour cream raisin/whipped cream extravaganza. Yum. Thanks so very much!!! Can I refrigerate the dough overnight or 2 before rolling it? Thank you! The best GF pie crust! Easy to make & delicious! I have tried premade GF mixes… they were just okay… this was so much easier & used what I already have on hand. Again, thank you! Our Turkey Pot Pie cooked up beautiful & delicious…and all gone! Made this pie crust over Christmas. My question is why would I ever make any other crust? This was absolutely amazing. Thank you so much! I have been going crazy trying to make a decent gluten free crust and this helped me so much! I added a little vanilla and used two egg whites instead of one whole egg. Turned out fabulous for the mini apple tarts I made. Thank you! Amazing! Flakey, everyone loves this! Perfect crust, even if it wasn’t gluten free! I didn’t have the King Arthur flour so I used 1 cup white rice, 1/2 cup brown rice, 1/4 cup almond, and 1/4 cup tapioca. Was glorious! Thank you so much! Will this work for fried pies? Best non gluten crust ever! Do wish you would refrain from the recommendation of palm oil though. It’s harvest is becoming devastating to some much habitate in the wild. This is the best GF pie crust I have found! Son and I are both gluten intolerant and both love a nice pie. Tried this today and can’t believe I haven’t found this site in the 5 years people have been commenting. We found this was a really nice pastry. Have been looking for a good gf pastry which will hold together in smallish pie moulds- wilI try doing the smaller versions next time. I used 1/2 cup each of potato starch, brown rice flour, buckwheat and tapioca starch. I also used coconut oil. I have made this pie crust about 5 times now, sweet and savoury and it is just terrific. I don’t often comment on sites but you deserve thanks because being gluten free you miss out on yummy stuff. I recently went to France with the family and the croissants looked soooo good and my family enjoyed them in front of me. Have you ever tried to make croissants? Thanks for the great pie crust recipe! I was wondering If I can let it chill overnight in the fridge. Will it turn out the same? Also can I use this crust for lemon meringue pie. Thanks. I’ve been chasing the perfect GF pie crust recipe for some time. I’m used to King Arthur flours. In this recipe would you use their Measure for Measure which includes xanthum gum or just their regular GF flour? Thanks! Hoping to try this tomorrow in preparation for Thanksgiving. Everything I’ve tried so far is impossible to work with – especially the top crust. Nice Job! This is great – I’ve been looking for a good recipe for Gluten free crust and this one will do quite nicely for my apple pie. Thank you! I’m always skeptical of gluten free recipes that are “the best,” but this one lived up to the description. I used this on two pies – pre baked for chocolate mousse pie and double crust for apple pie. I partially baked the bottom crust for the apple. Both were excellent. I’ve always had trouble making pour crust and thus was better than any non – gluten free crust I’ve made. Thank you! Your recipe turned out great! I’ve been gluten free for several years now and pie crust has always been my nemesis! When this flipped into the pan my husband said “ great job on the crust! Wait, is that gluten free! ?” Came out wonderfully! Thank you! I was wondering if you’ve ever made pudding delight squares…you out make a crust than the cream cheeses mixture then instant choc. Pudding and cool whip on top…l can’t seem to get the crust part yet..used to make it before having celiac…sure hope you can help me..thks. First time ever I have made a successful gluten-free pie crust, thanks to your easy recipe. Thank you so much. Worked exactly as promised! Have a friend who is gluten and dairy intolerant so desserts are a challenge. Made a vegan chocolate cream pie using your crust and it worked perfectly and my friend was so so pleased. Only thing I might change next time is to add a titch more sugar. Thanks!! !